After the Parliament’s latest vote, the next step is to see how the EU will react to the idea of Brexit being postponed. This raises a number of challenges, primarily because the EU has to reach a unanimous agreement in order for Brexit to be delayed. So the no-deal scenario is still on the table. Nora Topor-Kalinskij, King’s College London, shares some thoughts. It does not fundamentally matter which Brexit scenario occurs. None of them resolves the primary questions Britain faces today. One of these is where to find the resources to sustain the current system of governance. This is a question which is faced not only by the UK. The primary issue for the whole Western world is that in the last 20 years or so electoral competition has increasingly focused on promises of improving economic conditions for the population. In a way, politics moved away from being a competition of ideas to being a competition about managing the existing system: how you tweak taxation policy, unemployment benefits etc. Part of this shift was a coalescence of centre-right and centre-left which we observed not only in the UK, but also in other European countries. The problem is that historically this electoral carrot – that a party would fight for improving people’s living standards – was sustained by resources from outside the country. 100 years ago these resources could be sourced externally through unequal exchange with different entities from abroad, first and foremost colonies. This is more and more difficult today under the current rules of international governance. This thinning of resources raises a huge challenge to the existing political order. What is to be done when people have been promised rising standards of living rising and instead face economic stagnation? This discrepancy is a key reason for the bottom-up backlash across Europe, embodied in populism. Coming back to Brexit, Britain’s exit from the EU does not address this problem in any way. Whether the recession that follows is a larger one or a smaller one, the UK cannot possibly get a better economic deal with the EU than it had previously. The part cannot overpower the whole! So it was clear from the onset that Brexit would not turn out positively in economic terms. When we talk about the issues of security and geopolitical strategy, again, Brexit offers no answers. 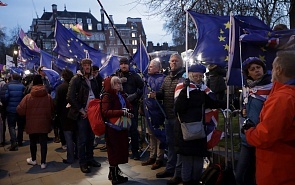 Whether there is a deal that is agreed upon before March 29, or whether another scenario takes place, this does not resolve the question of what kind of strategy Britain envisions for itself in the next 15, 20 years or more. The country and its elite remain divided. One part of the elite sees Britain’s future in the EU or at least with very close ties to the EU. Another part is sceptical about the EU’s future. They see the tide of globalisation receding, led by US efforts to weaken global governance institutions. They see the potential, hinted at by some of the elites in the US, of building another form of globalization under different terms. In this context, they think that to get a better chunk of the pie in the new world order, Britain’s best chance is to take action now to move away from the EU and to act as an independent player on the global stage. Until these divisions are resolved, Britain’s internal turmoil weakens its credibility in the eyes of foreign partners, with foreseeable adverse impacts for the economy, security etc. The fact that Parliament cannot seem to settle on what they want Brexit to look like will make other actors more wary to seek collaboration with Britain in the future, because of increasing perceptions of risk. I do not think that Brexit will change much in the relationship that the UK has with Russia for the following reason. Once Britain exits the EU, it will need to construct a new narrative about its role in the world. Part of that narrative will be that Britain is the standard bearer of liberal values. In this context Britain will a need a mirror or a set of mirrors in opposition to which this standard bearer image will be built. Russia is currently one of them, China may be another. Therefore public political relations between the UK and Russia are not set to improve in the post-Brexit context. This does not necessarily reflect on business relations. For example BP, a major British company, holds about 20% of shares in Rosneft and have been operating in Russia since the 1990s, making huge profits. So there are prospects here.